If you’re wanting to add a gigabit Ethernet adapter to your USB-C device, CHOETECH’s affordable adapter is just what you’ll want. With a good price of $16.99 on Amazon, the adapter is as simple as it gets. The gigabit Ethernet portion of the adapter is housed in a glossy black plastic casing, which does make some noise depending on how you’re holding onto the adapter (which shouldn’t be often). Assuming you’re not running it over with a car, the adapter should last quite a long time (if not forever). There’s quite a bit of CHOETECH branding. In fact, there are 4 logos on the adapter: on both sides of the plastic casing and on both sides of the USB-C plug. There are no activity LEDs on the Ethernet port itself, though there is a faint blue LED that’s illuminated when the adapter is plugged in and powered on. Tested with a Spectre x360 (featuring 2 USB-C / Thunderbolt 3 ports), Windows 10 had no issues. Within a few seconds of plugging the adapter in, it was recognized and immediately usable. For performance, I saw LAN transfer speeds of nearly 918Mbps down and a tad over 772Mbps up. Internet speeds are as expected, although ping times were a tad higher, and so were download speeds (all compared to a desktop PC running an Intel NIC). 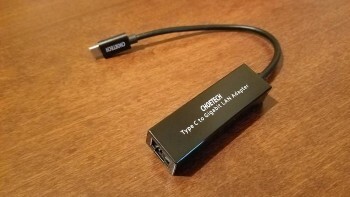 Overall, the adapter works exactly as it should, and given its sub-$20 price, I have no issues recommending this adapter to anyone who wants to add a gigabit Ethernet port to their USB-C devices.